Mix pie crust color by kneading together a small amount of white Sculpey with just a bit of ochre Fimo. Roll a ball sized to fit into your pie tin and to rise slightly above it. 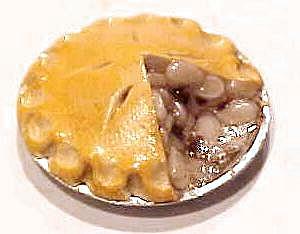 Press in pie tin and shape top of pie toward center with your fingertips. Trim where necessary. Cut the point off a toothpick and use this to flute the edges of your pie. Cut five slits in top of pie with X-acto knife. Bake in oven at 250 degrees for 10 minutes. While still warm, cut a piece out of pie (the size of two mini slices) with X-acto knife. Set aside to cool. To attain a "baked" pie look, rub on ochre artist's chalk, then paint pie with Fimo matte lacquer. Knead a tiny bit of ochre Fimo into transparent Fimo and roll a snake about 1/16 inch in diameter. Then roll about 8 tiny "raisins" from terra cotta Fimo. Bake as above, then slice snake diagonally into apple slices.